Habitat: Found in rivers and dams with rocks and caves for hiding. 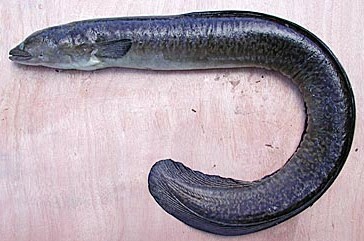 Bait: As with other eels, shortfin eels will eat just about anything such as crabs, frogs, earthworms etc. Description: Light brown colour, mottled black or brown. Fishing Strategy: Use strong line, when the eel is hooked it will retreat to any rock or cave. The angler will need to set the hook and keep pressure on the fish to avoid the eel going into a cave. If the eel goes into a cave, then the line will wear on the sharp rocks and break. Extremely large species, care must be taken when landing and handling. Due to the species large size - care must be taken when handling the fish.